It is feels increasingly complex to be a Star Trek fan. Things started off being about Kirk and co, then Picard, then Sisko etc. By now there are various TV shows that have been and gone, but also films that are set in parallel universes and I have no idea what is happening in Discovery half the time. Even if you are on top of the TV and Film versions of Trek, you may not know what is happening in the books. 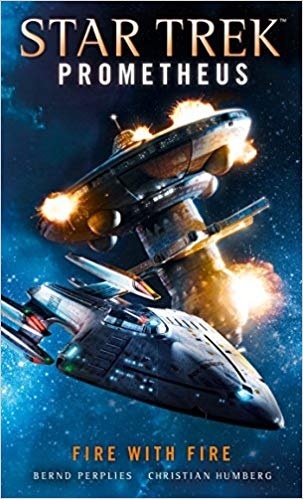 Star Trek Prometheus: Fire with Fire by Bernd Perplies and Christian Humberg is set on The Prometheus, a new ship to me. How am I meant to cope with even more information? The Renao are an insular, but peaceful race that have cut all ties off with the outside universe, preferring to stay within the confines of their own Home Worlds. When a terrorist group claiming to be Renaon start to destroy populated targets killing thousands, their solitude is no longer an option. The USS Prometheus is sent to Lembatta Cluster to investigate if it is all the Renaons who are to blame or just a few. As the terrorists have targeted more than just the Federation, the crew of the Prometheus also have to deal with a Klingon ship along for the ride. There is a lot going on in Fire, not at least learning the new characters. I am a Star Trek fan, but not a true fanatic, so forgive me if I do not know the likes of Captain Adams et al. Having all these new characters is a double edged sword as you can start without any baggage, but Perplies and Humberg do need to pad the book out with more character development than would be the norm for a Trek novel. Fire is part one of a trilogy and it does feel a little heavy as if the authors needed to expand the books get all the exposition in and characters developed to the level that we care. On a more positive note, this is one of the most authentic Trek books that I have read in a while. It feels like a Trek book for a real fan of the shows from the 90s i.e. lots of explanation of what is going on and strange science fiction elements throwing a spanner in the works or being used to fix the problem. When reading you feel like you are in the midst of a solid mid-90s episode from The Next Generation. The type of thing that really got nerdy and embraced some of the harder science fiction elements of Trek. Although set far in the future, parallel with the later days of Picard, Fire also has echoes of our present. Perplies and Humberg have used the Trek setting to explore some of the current rises in right wing thinking and apparent uptick in xenophobia. As this trilogy continues this trend becomes more front and centre. In Fire there is only a hint of what is to come, but you get a sense of insular thinking even in a book that spans galaxies. This foreshadowing is a little annoying because you never actually get there. You can read this book as a standalone title as there is an action set piece at the end, but there is no real closure, just a promise of more to come. Having read further in the series it becomes apparent that the three books may have been better developed as one long title. Fire will still entertain a fan of Star Trek, but it is not the book that will encourage new readers into the fold, even those that enjoy Science Fiction. Its reliance on procedure and dialogue means that it is a dense book that could have just a little thinning in places, but rewards Trek fans like to know the minutia. Written on 11th January 2019 by Sam Tyler.